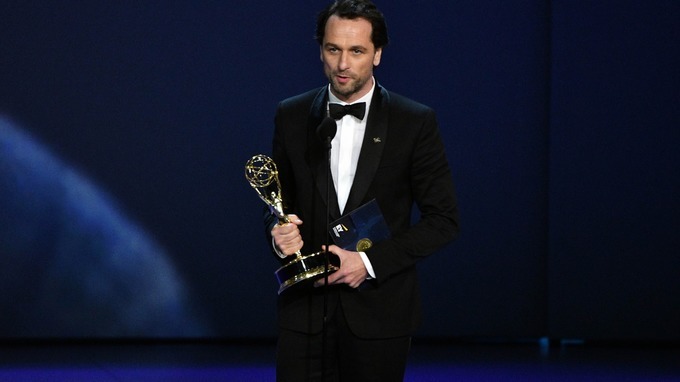 Welsh actor Matthew Rhys on Monday took home the Emmy for best actor in a drama series for his role in FX's Cold War spy thriller "The Americans" -- a big win for the critically acclaimed show in its final season. Some industry pundits have called it the "Jon Hamm factor," as both actors won their lone Emmys for defining roles in their final year of eligibility. Rhys bested a tough field that included last year's winner Sterling K. Brown ("This is Us"), Ed Harris ("Westworld"), Milo Ventimiglia ("This is Us"), Jeffrey Wright ("Westworld") and Jason Bateman ("Ozark"). "Parts like these come along so rarely," Rhys told the audience at the Microsoft Theater in Los Angeles, thanking show creator Joe Weisberg. "What you created and risked, I will be forever in your debt." The 43-year-old Rhys starred for six seasons as Philip Jennings, part of a husband-wife team of Soviet sleeper agents posing as Americans -- and living next door to an FBI agent. "We had a cast and show we could only wish for in a fairy tale," he said. His now real-life partner, Keri Russell, plays his wife Elizabeth on the show. She too was nominated for an Emmy, and he joked about what the job had brought them. Addressing Weisberg, he quipped: "Your good self not only gave me the part and opportunity of a lifetime, you also gave me a son. I just hope the little bugger is asleep." He thanked Russell, but explained that as opposed to the earlier on-air proposal by Oscar director Glenn Weiss, "she said, 'If you propose to me, I'll punch you clean in the mouth'" -- a distinct possibility, given her fighting chops seen on the show. Until Monday's gala, "The Americans" had only won two Emmys -- both for guest actress Margo Martindale, who plays the spy couple's handler Claudia. But now they have four, as Weisberg and Joel Fields also won a statuette for outstanding drama writing. Rhys, a native of Cardiff, was trained at the Royal Academy of Dramatic Art in London. He first came to the attention of US viewers when he starred alongside Sally Field in ABC's family drama "Brothers and Sisters." Other notable roles include a turn in last year's journalism drama "The Post," in which he played Daniel Ellsberg, the man who released the Pentagon Papers to The New York Times, The Washington Post and other papers. Upcoming projects include "Mowgli," a live-action film based on "The Jungle Book," and thriller "The Torture Report."